Available in a 9# wedge. 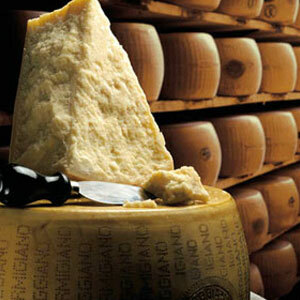 Use as part of a cheese plate, grate over pasta and risotto, use in salads, sauces, and soups. It was praised as early as 1348 in the writings of Boccaccio; in the Decameron, he invents 'a mountain, all of grated Parmesan cheese', on which 'dwell folk that do nought else but make macaroni and ravioli, and boil them in capon's broth, and then throw them down to be scrambled for; and hard by flows a rivulet of Vernaccia, the best that ever was drunk, and never a drop of water therein. During the Great Fire of London of 1666, Samuel Pepys buried his 'Parmazan cheese, as well as [his] wine and some other things' in order to preserve them. In the memoirs of Giacomo Casanova, he remarked that the name "Parmesan" was a misnomer in his time (mid-18th century) as the cheese was produced in the town of Lodi, not Parma. This comment originates probably from the fact that a grana cheese very similar to the "Parmigiano", the Grana Padano, is produced in the Lodi area.